The PowerClaw Latching System (US Patent No. 8,297,464) used on all NANUKNANO cases is engineered to keep your case closed during the toughest of missions. The PowerClaw clamps the case tightly closed using compressive force while the integrated slide lock prevents the case from opening during transport or when dropped. Polycarbonate construction ensures your precious items remain safely inside the case no matter where the journey takes you. 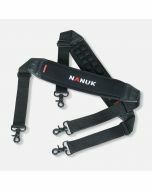 The waterproofing seal used in all NANUK watertight cases is custom designed to fit our products. The seal is designed to resist deformation and fatigue, ensuring a long lasting watertight seal. Our waterproof cases are ideal for applications such as search and rescue, marine transportation / storage and diving. Any of our many dealers can easily outfit you with one of our waterproof cases, accessories or other products. NANUK equipment cases and transportation products are complete with a lifetime guarantee in materials and workmanship for the life of our products. The integrated bezel system on the lower portion of the case allows a panel kit to be easily installed without having to install a secondary bracket or drill holes in the side of the case. The optional waterproof panel kit is available for all 11 NANUK case sizes.